De Hoop is a South African nature reserve along the Garden Route and a mere 3-hour drive from Cape Town. Situated in the Overberg region of the Western Cape. This South African reserve near Cape Town is an ideal stop-over for an en-route self-drive Garden Route Holiday. The reserve is located on the coast near the southern-most tip of Africa in the Overberg region and can be approached from either Bredasdorp or Swellendam. 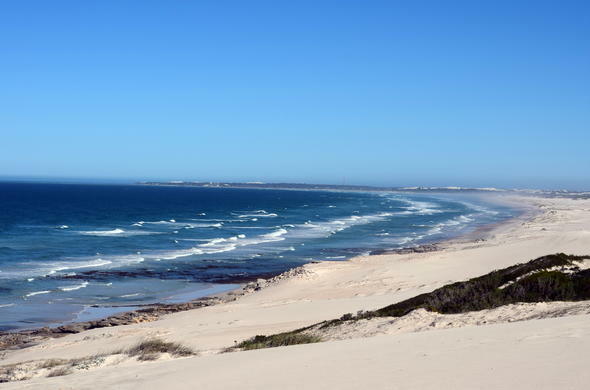 De Hoop Nature Reserve is a World Heritage site encompassing 36 000 hectares of fynbos, sand dunes, mountains and a protected marine reserve along 70 km of pristine coastline. Characterised by quaint towns, delicious local food and up and coming wines, the Overberg, Western Cape, South Africa is also along the famous Garden Route and Whale Route. This Western Cape Nature Reserve covers 36 000 hectares and includes 3 nautical miles of marine protected area. It is a World Heritage Site due to endemic species from the Cape Floral Kingdom. De Hoop vlei (wetland) is also a Ramsar site, recognising the resident bird species. The reserve has over 70km (43 miles) of coastline and extensive wetlands. There are 260 species of bird including a breeding colony of pelicans and the rare Cape vulture. Amongst 86 mammal species, you can see Cape Mountain zebra, rare bontebok, eland, Grey rhebuck, baboon, Yellow mongoose, Caracal and much much more. The reserve has a Mediterranean climate and receives most of its rain during the winter months from May to August. Annual rainfall is around 380mm and August is generally the wettest month. The relatively warm-offshore waters result in mild winters and warm summers. Sea mists and light drizzle can occur throughout the year. The most frequent summer winds are west and south-easterly while westerly and southwesterly winds prevail in winter. Wind speeds may reach 60 km/h or more. De Hoop Nature Reserve is located on the Whale Route. Koppie Alleen is one of the best whale-watching sites in the world. This nature reserve is situated on the Indian Ocean lies in the Overberg Region, Western Cape, South Africa.